Peaceful mountain-top 1500 sq ft vacation home in Poconos, breathtaking views from 2 surrounding upper decks and additional 400 sq. ft. sun deck from steps down to large terrace. 5 acre wooded mountain-side lot at end of street. Minutes from ski resorts, golf, white water, fly fishing, tubing, horseback riding, hunting, hiking Lehigh River Gorge Trail. 15 minutes to Jack Frost/Big Boulder. 20 minutes to Jim Thorpe. Local restaurants unsurpassed. Off of the terrace sun deck, play a game of horseshoes, enjoy campfire pit, barbecue on party size gas grill. Relax indoors with 1500 sq. ft. of quiet comfort. WIFI, cable including ESPN, FS1 on 3 large TVs, 50" in lower t.v. room, 40" main floor, 32" master bedroom. Accommodates up to 14 people. Two main floor master bedrooms, queen bed in each. Top floor, large bedroom sleeps 6: bunk (full on bottom, twin on top) and 2 trundle beds. Lower floor bedroom bunk sleeps 3 (full on bottom, twin on top). Lower floor t.v. room has a couch with lay down backrest to form extra sleeping space if needed bring a sleeping bag. Air conditioned. Washer drier. Full kitchen, ample pots and pans. All linens provided. Check in 3 p.m., check out 11 a.m. Occupancy 14. Sorry, no Prom or Senior Week rentals. We love all outdoor sports including skiing, hiking, horseback riding, fishing, hunting, trail running, rock climbing, marathon and ultra running. 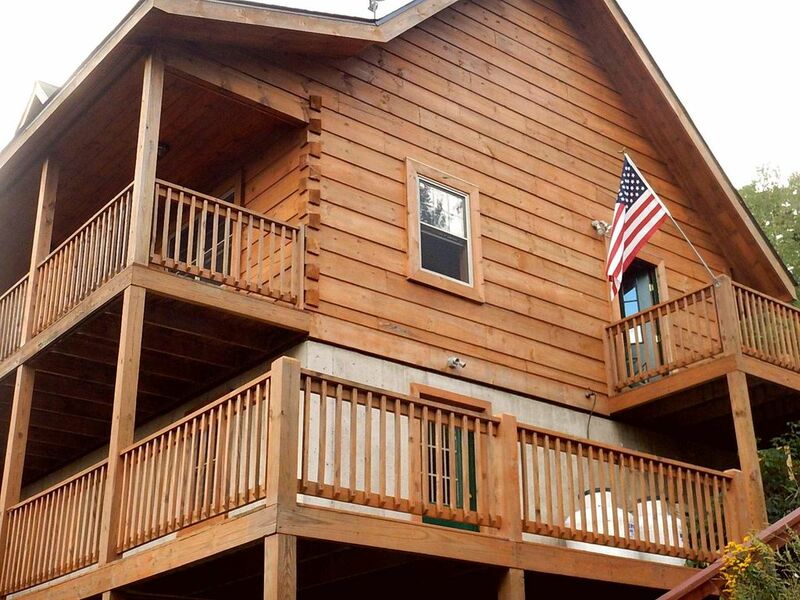 We want to share our beautiful Pocono vacation home near White Haven (4 miles) and Jim Thorpe (24 miles). We have been coming to the Pocono area with our children to relax and unwind for over 30 years. The sunrise views from this peaceful secluded property are unmatched. Fresh towels provided, no maid service during your stay. Split Rock Lodge is 14 miles away. Ski resorts are 10 miles west on SR940. Our cabin is at 1,700 feet elevation, on a ridge top facing east for incredible sunrises. Most rooms have an in window air conditioner. Linens are clean upon arrival but there is no maid service during your stay. We provide some laundry detergent. Towels are clean upon arrival but there is no maid service during your stay. We have place settings and kitchenware for 10. There is a large dining table in the main room. We'll provide paper towels and extra trash bags. This property features spectacular views from large decks and from terrace on a sloping mountainside lot with a 400 sq ft sun deck. The terrace has a fire pit and horseshoes. Please see photos. Check in 3 p.m., check out 11 a.m.
Our second trip to this location and it was very nice! We will certainly book again. Great place to stay close to Jack Frost! Cost spot all of our friends enjoyed their stay! Thanks for staying at our house. Please come back next year. Atlee was very quick to respond and the home was very clean with beautiful views! Beautiful house easily slept 10 of us. It had plenty of room and we never felt cramped. The view is amazing. It had everything as described plus more. We were able to get an early check in as well due to the impending snow storm which saved us so much hassle on the roads. Highly recommend! Highly recommended. Clean and respectful. Peaceful mountain-top 1500 sq ft vacation home in Poconos, breathtaking views from 2 surrounding upper decks and additional 400 sq. ft. sun deck on walk down terrace. 5 acre wooded mountain-side lot at end of street. Sorry, no Prom rentals or Senior Week. Minutes from ski resorts, golf, white water, fly fishing, tubing, horseback riding, hunting, hiking Lehigh River Gorge Trail. 15 minutes to Jack Frost/Big Boulder. 20 minutes to Jim Thorpe. Local restaurants unsurpassed. Off of the terrace sun deck, play a game of horseshoes, enjoy campfire pit, barbecue on party size gas grill. Relax indoors with 1500 sq. ft. of quiet comfort. WIFI, cable including ESPN, FS1 on 3 large TVs, 50" in lower t.v. room, 40" main floor, 32" master bedroom. Accommodates up to 14 people. Two main floor master bedrooms, queen bed in each. Top floor, large bedroom sleeps 6: bunk (full on bottom, twin on top) and 2 trundle beds. Lower floor bedroom bunk sleeps 3 (full on bottom, twin on top). Lower floor t.v. room has a couch with lay down backrest to form extra sleeping space if needed bring a sleeping bag. Air conditioned. Washer drier. Full kitchen, ample pots and pans. All linens provided. If booking within 30 day window 100% due at time of booking.